Many girls strive to have ideal hair trying to find the right solution to looking perfect at all times. Above all, hair requires constant care to have a good texture for shaping it. The hair texture changes only when you treat it a lot. However, you can keep the balance with care and hair styling. If you want your haircut to be like the haircuts of top models or some movie stars then a curling iron will be your best friend in the realization of such hairstyles. To reach an effect of perfect locks takes a lot of time and effort. Besides effort, you will need experience. You can’t expect to get it right the first time. You will have to be patient, but I promise it will pay off. Of course, the texture of hair plays an important role, almost everything about hairstyles depends on it. You should begin by imaging what you want your hair to look like. Then you have to figure out how to use the curling iron properly in order of achieving that perfect hairstyle you dreamed about. Read Also: Some successful tips for straightening your hair with a flat iron. In order for the locks to be “full”, you have to have knowledge of handling the curling iron. For a more lax look of your hair locks hold the iron vertically and for them to be stronger you will need to hold the curling iron horizontally. When you are done with using the curling iron, after it cools off, always wipe it off with a wet cotton mop, in order to remove any styling products, such as foam or gel. In case you have curled the lock ends, you can easily straighten them afterward, to have a more casual hairstyle. Before you even get yourself entangled in hair curling with a curling iron, it is mandatory you prepare the right products beforehand. Also, you need to have realistic expectations. The locks you are making yourself at home will never be as good as the ones you get in a hair salon. I recommend a curling iron without the so-called pinch because it is easier to work with and it won’t break the lock. The number one requirement for having amazing locks is properly dried hair root. You don’t treat this area with the curling iron, instead, you want to start curling at least 2 cm lower. In this manner, your locks will look more natural. When you curl your hair with the curling iron, you always curl it in the opposite direction of your face. This way, your hair will look more natural and your hair will have more volume and texture. Turn on the curling iron and set the right temperature, prepare the heat protection product, lock enhancer product, hairspray. Prior to curling brush your entire hair and apply the protection product so your hair won’t get damaged in the process. Separate a third of your hair (the part behind the ear) because this is the part you will curl first. The hair behind the ear needs to be free while you can tie up the rest of the hair on the top of your head. First, curl up those free locks. Be careful have you handle the curling iron, the locks need to be perfectly spiral. When you are done with the first lock, split the remaining hair into two parts and pin down the upper lock. Now curl the second lock. In the end, curl up the rest of your hair. Now combine the three locks for better cooling. Repeat the process on the other side of your head, on the part behind the ear. 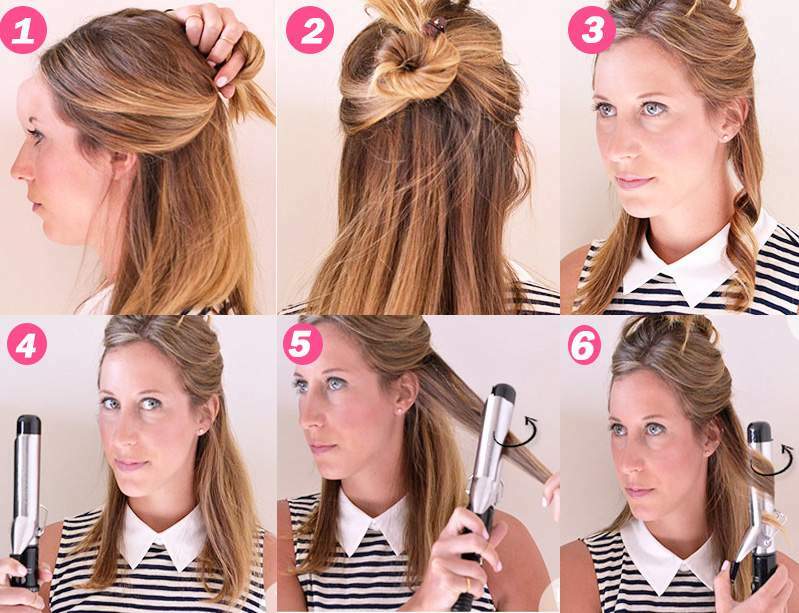 Read Also: Some useful homemade methods to curl your hair without using curling iron. Now it is time for the back of the head. Again, separate the part closest to the neck so you can finish as fast as possible and seclude smaller locks and wrap them around the curling iron. Do not take locks too big so you can finish faster, you will not accomplish anything because the curling iron cannot curl thick pieces of hair. Slowly pull down your hair until you are done with the back part. When you are done with it, return to the locks adjacent to your face. Wrap them around the curling iron for extra curling. Brush the hair with a comb with wide teeth and apply the product for lock enhancing. Shape the hair with your fingers. Maybe put on some hairspray so the locks can hold better but use a mild spray which won’t make your hair stiff. An additional tip for you – curl the hair from the face, never towards the face. Be mindful of how you pull out the curling iron because if the lock falls apart you won’t reach your goal. Use professional products which really protect your hair from heat. Constant exposure to heat be it from curling iron, hair press or a hair dryer damages the hair and makes it fragile. 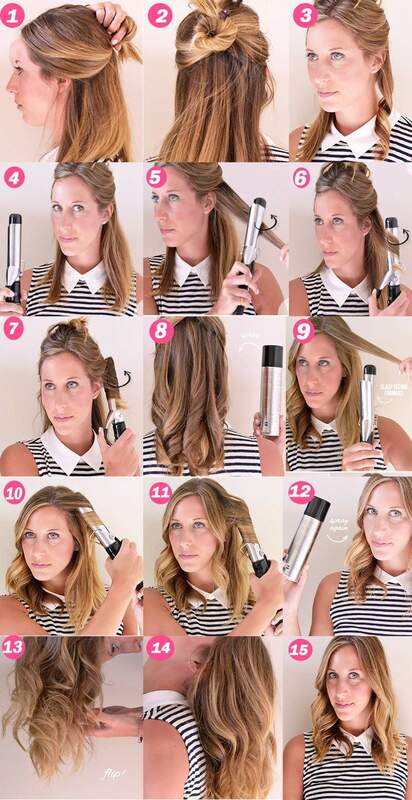 Finally, curling hair takes a lot of practice. You will get better with time, just be patient. Don’t be surprised if a hairstylist does it better than you. They have years of experience in the job which makes them so successful. This is why they can make locks tidier and stronger. Do not let that get into your head. You will make it one day! If you want steady and firm locks it is crucial that you prepare your hair. First, spray it with a heat protection product to prevent any hair damage. Then dry the hair completely, A hair curling iron cannot be used on moist or even worse wet hair! Drying will ensure you get those locks. 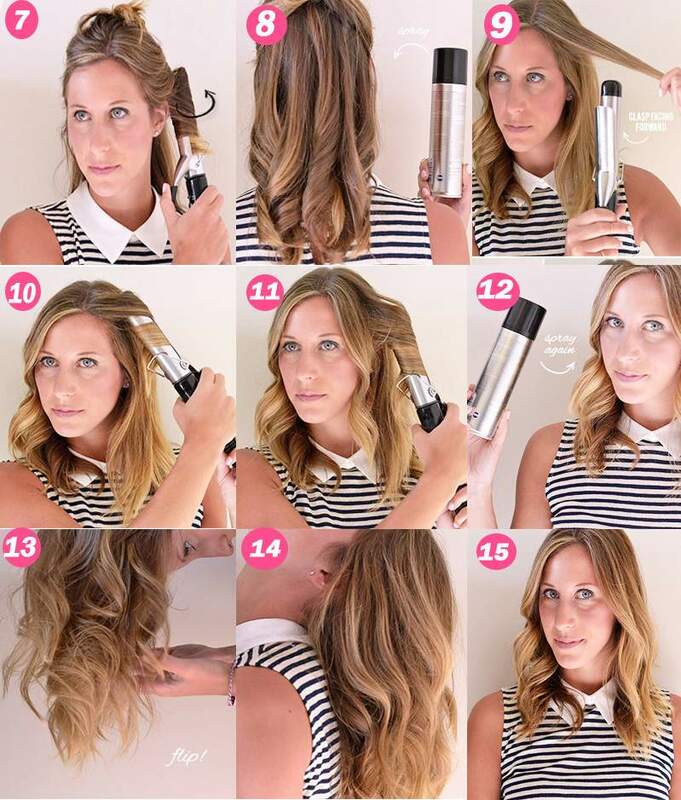 Only now you can start using the curling iron. You can use hairspray, this step is optional. Do not use hairspray prior to using the iron, because the heat will burn it and harm your hair. Before you start using the iron make a section on the desired spot. If you want a natural look curl outwards, clockwise from the right side and counter-clockwise from the left side. Most of the women twist the curling iron around the hair. This is wrong! If you want locks which look natural, you are doing it all wrong. The curling iron needs to go down the hair, and the lock needs to be wrapped around it. Also, don’t curl the lock around its axis because doing so, the heat is not properly cast. Imagine your hair is a lace you need to carefully wrap around the curling iron. It is ok to take bigger locks to get bigger curls, but too much can be a problem. Take less, but take different volumes of hair in order to make the locks look more natural. The curling iron produces a large amount of heat. Just imagine what it can do to your hair if you hold it too long. Such high temperatures can heavily damage the hair. Adjust the curling iron to a low or medium temperature if you have fragile hair and don’t hold it longer than 3 to 4 seconds. When you curl a lock, leave it and wait for it to get cold. Do not touch your hair with your fingers right after removing the curling iron because the lock won’t have enough time to fixate. Also, it can make your hair electrified, so just be patient. I suggest you apply the hairspray when your hair is tight and cold. You only need one. The best ones have 2.5 cm diameter because you can do anything with it, a lot more than with a thicker one. If you want thicker locks, just take larger amounts of hair. Another thing to consider when buying a curling iron is getting a ceramic one. These will cause less damage to your hair, and you will also avoid electrifying it. That was all my girls! 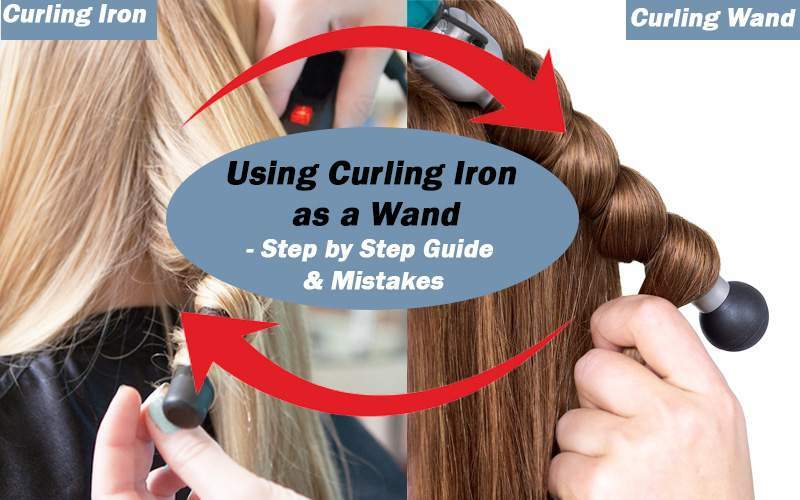 I hope you enjoyed reading this article and found all the help you need in using a curling iron as a wand. Remember to follow the steps mentioned beforehand, sticking to them is crucial if you want natural looking, strong and thick locks. 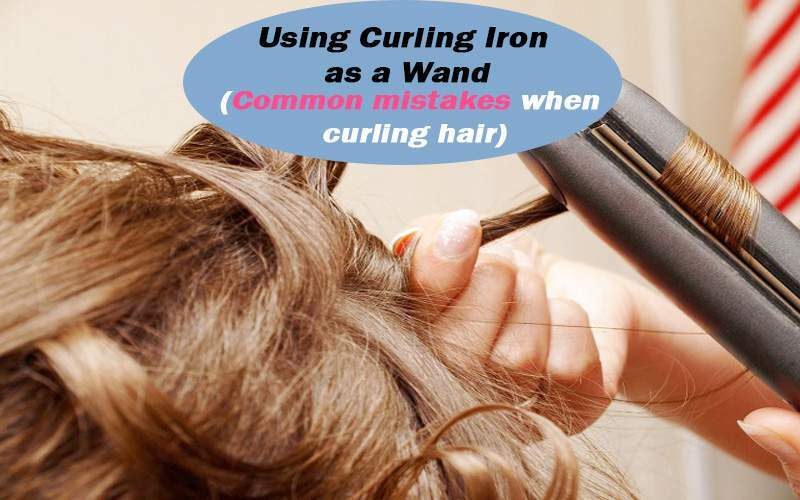 Also avoid making the common mistakes I mentioned, because it is easy to fall into these traps, especially when you are new to using a curling iron as a wand. Just be patient and keep trying, your effort will eventually pay off, and you won’t have to waste a lot of money on going to a fancy hairstylist!